Those who work in roles that provide spiritual or pastoral support often have conversations with people about their values, hopes, challenges and ways to create a life that is meaningful to them. 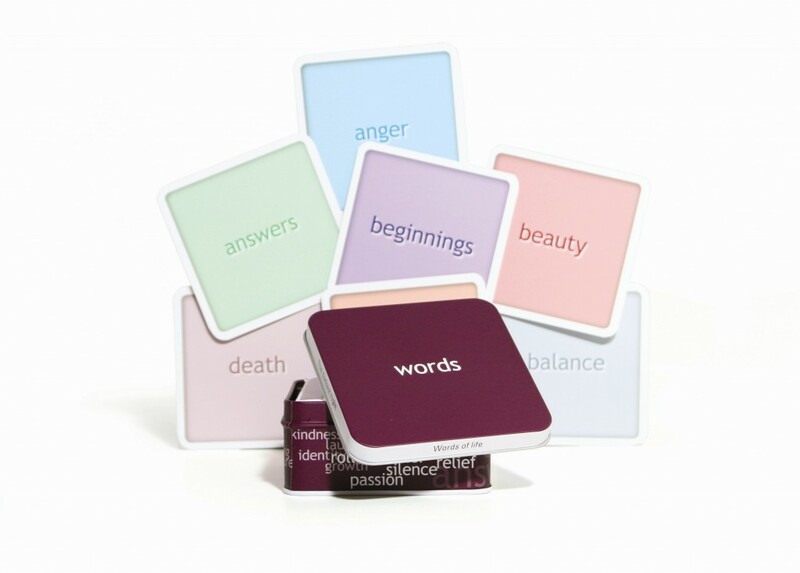 These subjects are natural territory for the card sets and stickers created by Innovative Resources because they are designed to prompt conversation, storytelling and reflection about feelings, strengths, hopes, goals and choices. 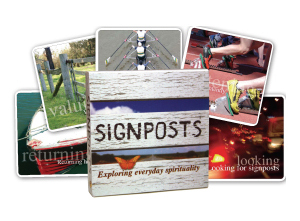 While all our card sets could find a happy home in the tool kits of chaplains and pastoral carers, we would like to draw your attention to a few that have been created especially with you in mind: Signposts—exploring everyday spirituality is a set of photograph-based cards designed to invite anyone to talk about meaning and significance in their lives whether or not they couch this in religious terms. Angels—the strengths of everyday kindness is a truly soulful and quirky set of cartoon-style angel characters painted in water colour, each with a word naming a key strengths or quality such as creativity, patience, endurance, contentment, vitality. Note to Self is all about the choices we can make to be in the ‘driver‘s seat’ of our own lives and let go of blame. Life Tweaking (inspired by life coaching conversations) is a card set that opens up conversations about identity, purpose and hopes and dreams – many of the issues canvassed in pastoral care. While our resources do not espouse any particular religious tradition, they do offer many opportunities for speaking about what is important in our lives. Often, this kind of conversation touches on what we hold dear. For some people this means that spiritual and religious beliefs may naturally arise in the conversation. Whether a person is religious or not, we hope that anyone, anywhere—regardless of their cultural or spiritual background—will feel comfortable using our resources. Everyone knows the adage, ‘A picture is worth a thousand words’ and whether you work one-on-one or with groups, our card sets feature rich visual metaphors using photographs, cartoons, paintings, drawings and graphic design. They are very useful tools for building creativity and variety into your work—something that can inspire and energise you as well as the people you support. how they are going along the way. Strengths-based, Solution-focused ResourcesThe Power of CuriosityResources for Talking About EmotionsHarnessing the Power of QuestionsGrief and LossLife Tweaking or the Grand Plan?Celebrating Indigenous StrengthsPicture Books: Not Only For Children! The card sets, books and resources produced by Innovative Resources arise out of solution-focused and strengths-based practice and principles. Our focus on strengths and ‘seriously optimistic’ hopes for the future is a core thread that flows through all our resources. A ‘strengths approach’ to practice is a way of being and working with others that highly values the inherent strengths that exist within every person, as well as those strengths that can be developed along the way. It focuses on what is working well, rather than on problems and deficits. The strengths approach holds the view that it is from our strengths that we can grow and learn most effectively; and that it is to our own strengths and the strengths of others that we should look in times of trouble and challenge. And for a newbie in our strengths repertoire have a look at The Nature of Strengths. This is a set of 28 cards with exquisite original watercolour paintings in the style of an eighteenth-century naturalist’s notebook. Each card describes a characteristic of a plant, animal or insect such as: Choosing Wisely, Changing Direction, Having Heart, Letting Go, Tuning In, Standing Solid. Use these cards to help clients build these strengths or skills in their own lives. Have a look at this one—you can ‘ooo’ and ‘ahh’ over the exquisite illustrations of artist, Robyn Spicer—but more than that, this is a fantastic tool for anyone to learn from the genius of the natural world while building their own life skills and resilience. 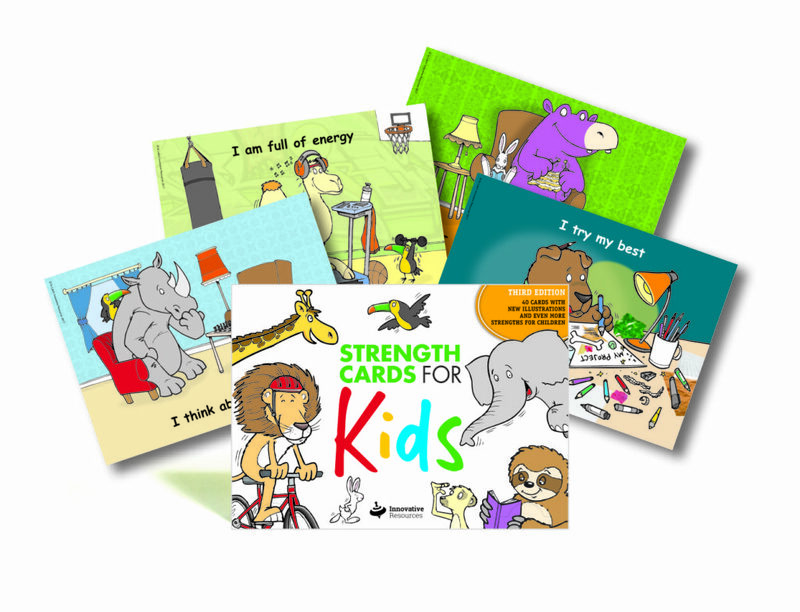 Many practitioners have a collection of Innovative Resources’ card sets from which they can select a resource they think will work best for a specific person or group. Another approach is to place one or more card packs on a table, counter or shelf—anywhere they may be noticed. For example, cards can be pinned to a noticeboard or stuck on a door or wall where they may attract attention. This could be called ‘bump-into therapy’—allowing the person’s own spontaneous curiosity about a particular card set to lead the way. For children and adults alike, the colour and gentle humour in many of our card sets create interest and help people find images, metaphors and words to describe what is happening in their lives. Sometimes pointing at a picture allows a communication to happen about how they are feeling, when words alone fail or are inadequate. Cards or physical ‘artifacts’ seem to readily evoke curiosity, memories, reflection and storytelling. With their strengths-based messages, our cards can be used to help people move away from a focus on ‘The Problem’ by encouraging them to talk about their hopes and dreams for the future. In addition, when two people sit alongside each other and look with curiosity at a set of cards together, something interesting takes place: it shifts the dynamic created by two people sitting opposite each other. Even placing cards on the floor or on a table, and walking around the cards together, is a great way to introduce movement and a sense of ‘the journey’. Movement can change the mood and the dynamic significantly—sometimes in profound ways. Experiment and see what you discover! We live our whole lives in the company of our emotions and yet it can be very difficult to name and share our feelings with others. Sometimes we can be so overwhelmed by our emotions and body signals that we don’t even know where to start in trying to express them! And often we humans are experiencing more than one emotion at a time—sometimes seemingly contradictory ones. We can be sad and happy at the same time, we can be bereaved and relieved, scared and excited, nervous and courageous. It can be very confusing—especially when we are under pressure and doing it tough for any reason. Emotions are often at the centre of counselling conversations. The ability to recognise, articulate and manage feelings—and to take into account the feelings of others—are fundamental to emotional intelligence. They are also core features of a nurturing and compassionate family, community or society. Developing our emotional intelligence is a life-long ‘work in progress’ for most of us. 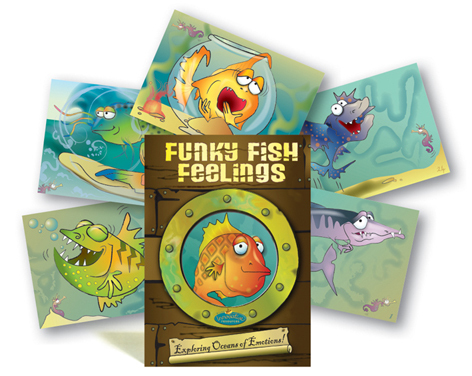 One of the primary publishing arenas of Innovative Resources is emotions and feelings. Any of our emotions cards will find a natural home in the tool kits of psychologists, counsellors and therapists. The Bears: the absolute classic for talking about emotions, and still the best selling of our resources. Can be used with adults and children alike, and has no words so very versatile with non-English speakers or even very young children. 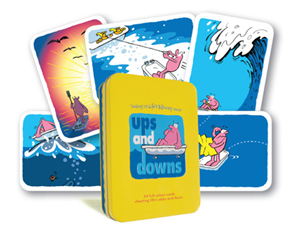 Ups and Downs: A little pink character adrift on a sea of emotions in a bathtub. Life is full of Ups and Downs. Use these to help develop the navigation skills. Girltopia: especially for girls around puberty, and woman of any age—feelings, relationships, body image, healthy choices. This is a brilliant (and very beautiful) resource written by Jane Bennett, internationally-acclaimed author, counsellor and educator specialising in working with girls at puberty. This is an area of work set to take off big time. Car R Us: Derived from Choice Theory these cards provide many ways for working with children and adults to build emotional literacy and their capacity to make good choices in their lives. If you are looking to engage boys, this is a good one to try as the car metaphor can sometimes capture their imaginations and interest more readily than other metaphors may do. The right question at the right time is very powerful. In many ways questions can be more interesting than answers. Answers can be fluid—they may change with time. And some questions—perhaps we can call them ‘living questions’—do not seem to have answers as such; perhaps ‘responses’ is a more appropriate word? Take for example, the hoary old chestnut: ‘Who am I?’ Pondering this question over time and discovering what our response may be at different stages in our lives, generates insight and self-knowledge. Whether existential or extremely practical (such as ‘What’s for dinner?’), questions can be very welcome doorways into possibility when things are getting tough and hope seems to be in short supply. Optimism Boosters is a simple postcard size set of cards that is very effective at bringing some fresh air into any situation. 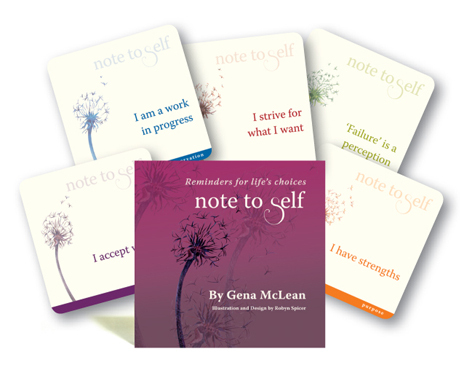 Authored by practicing psychologist and clinical nutritionist, Selena Byrne M.A.P.S., these cards feature a simple question to awaken possibilities, goals and strategies for moving forward. While just so simple, these little cards can pack a big positive punch. A person can pick a card that will be their ‘question for the day’ or ‘question for the week’. They can select a question that really intrigues them or feels like a way forward for them … or perhaps a question that surprises them. You can use Optimism Boosters near the end of a session. Invite the person to pick a question to take away and ponder or journal about, and bring their thoughts and responses to your next meeting time. Deep Speak is another fantastic questions-based resource. The idea for this resource was brought to us by a chaplain and a colleague who wanted a resource to use in their youth groups. This card set works well for many young people both visually and in how it lends itself to playful activities. Made up of a single question on each card—some meaningful, some surprising, some puzzling, and some just plain hilarious—these cards are tailor-made for storytelling and laughter. Deal them out and play card games … or ask a client to select a few at random (or deliberately) and use this as a way to get to know the client or group a little better. You can also pre-select some cards from the array if you wish to narrow the focus and style of the questions. Life Tweaking is a boxed set of 50 cards plus booklet that belongs in the ‘tool kit’ of anyone who works with others to offer support or help towards a better future. For this reason it is appropriate for chaplains and pastoral carers, as well as counsellors, therapists, psychologists, life coaches and mentors. Through questions, conversation, storytelling and reflection, Life Tweaking provides opportunities for people to identify their key strengths, values, priorities and next steps. Each card features a key topic (such as Goals, Happiness, Health, Risks, Teamwork, Balance and Money) and two carefully-chosen, gently-challenging questions. Note To Self—a beauty from the practice wisdom of Choice Theory. Use for goal-setting, self-care and strengthening the capacity to make choices. Cars R Us—includes 52 cartoon-style car characters with a set of 10 Thinking Bubbles featuring questions drawn from Choice Theory. Symbols—A card set that arose out of grief and loss gestalt therapy. Bereaved Mother’s Heart—a picture book featuring one woman’s journey through grief and loss told through paintings and words. Angels: the strengths of everyday kindness—a card set with fabulously playful and soulful angels in water colour. Forget the sickly sweet—these are everyday angels you can invite into your own life or ‘gift’ to others. Cards like Angels and Strength Cards® have been used in eulogies at funerals to talk about the key strengths exhibited by the deceased person. Shadows and Deeper Shadows is a card set that grew out of the work of a practicing psychologist who was looking for a set of images clients could use to share something of their pain and difficulty. It is based on the understanding that sometimes difficulty and loss need to be heard before hope can emerge and pathways to resolution found. This card set consists of forty-eight evocative watercolour images depicting key challenges people sometimes face. 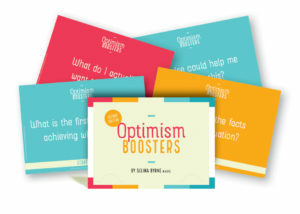 Some practitioners like to team these with Optimism Boosters, Strength Cards® (or any other strengths-based cards set from Innovative Resources) so the conversation can turn to strengths and possibilities. Life Tweaking or the Grand Plan? When it comes to creating change in our lives, sometimes a Grand Plan is a very useful thing. But sometimes, thinking about grand plans and wholesale change can seem overwhelming and daunting. Whether we are in grand plan mode or considering a ‘doona day’, sometimes it is the tiny tweaks to a situation that make all the difference in the end! A small crack in our lives can reveal a tweak or a very simple next step we can take. A little tweak can feel graspable, manageable, doable and even inviting. And a series of tiny tweaks can join forces to create big, life-changing patterns. Life Tweaking cards are a unique and powerful catalyst for change and are right at home in the tool kits of all change agents such as counsellors, psychologists, therapists, coaches, mentors and supervisors. Produced in partnership with SNAIC, a leading Indigenous organisation, Talking Up Our Strengths is a beautiful, photomontage-style card set for celebrating the strengths of Aboriginal and Torres Strait Islander people, communities and cultures. While these cards particularly celebrate Australian Indigenous culture, they can be used for storytelling and building the strengths of any community or culture. This is an absolute must for all pastoral carers and chaplains interested in building a culturally-inclusive conversation space for the people they support. Picture Books: Not Only For Children! Picture books are powerful learning tools for adults and children alike. And there are many that offer solace and wisdom about finding a way through depression, anxiety, grief and loss, drought, feelings of isolation and more. And most people love being read to, regardless of their age! Try it in your next group or one-on-one session—with a carefully chosen picture book, you will find that great learning can arise from stories presented in this delightful and soulful way. Are there children you work with who feel left out and unvalued? (Nearly everyone does at some time in their lives.) The Wrong Stone is a picture book that is both humorous and soulful. It is a delightful retelling of a time-honoured metaphor—the stone the builders rejected—and its message is that everyone has a rightful place in this world. The Wrong Stone challenges us (in our groups, communities, parishes and schools) to wonder who in our midst is overlooked. Whose needs are we blind to? How can everyone’s unique presence and contribution be valued? The Wrong Stone has been read in church services, classrooms, school assemblies and staff rooms. It has been turned into a play, a musical and even a maths activity! Check out our other picture books such as Captain Grumpy, a pirate story with a difference. Captain Grumpy was grumpy—until one day he realised that grumpiness had become the boss of his life and was stopping him being the person he really wanted to be. His transformation ‘flummoxed and flabbergasted’ his crew. This book contains a simple but powerful message about anger management and finding out what is real ‘treasure’ for each of us. Byron and the Chairs: about sibling rivalry and how to work with that green eyed monster—jealousy. I See You: Seeing the black dog. Seeing may not be everything, but it is a lot! Violet’s voice: Learning to find and use all the different tones of our voice … and our own unique presence. 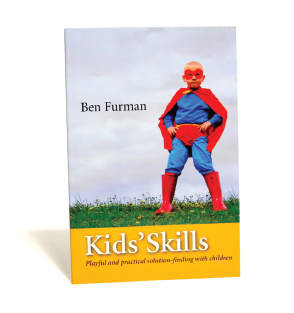 Kids’ Skills: (non-fiction text) for adults supporting children. Presents a simple, fun, practical 15-step method for working with children to transform problems into skills to be learned. There has been great success worldwide using the ‘Kids Skills’ method.